It has been a highly successful school year. We achieved record test scores and demand for enrollment remains robust. The energy and excitement around our school has been palpable. I am extremely proud to be part of this school and to make my contribution. That said, it has been a challenge. I developed bags under my eyes from many sleepless nights and a persistent pain in my stomach. Summer couldn’t have come soon enough! Just before summer break started, and my daydreams of paddle boarding on the river were about to come to fruition, I tore my distal bicep tendon. The distal bicep tendon connects the bicep muscle to the bone. My bicep was detached and pulled up toward my shoulder. “Ouch!” is right. Not only did it hurt but it put a damper on river sports, judo, and fun in general. I was not a happy teacher. My misfortune, however, provided me an opportunity to reflect, refocus, and read neglected emails. It became clear that I had let my job as a seventh grade humanities teacher stress me out to the point where one of my tendons popped! I taught class for three weeks with a ruptured bicep. There are a whole bunch of reasons (none of which are good) for why it took three weeks to get repaired, but I won’t bore you with the details. The good news is I now have the tools to deal with the stress that caused all my troubles in the first place. In reviewing those neglected emails, I came across an offer claiming to reduce stress through mindfulness. “Mindfulness means maintaining a moment by moment awareness of our thoughts, feelings, bodily sensations, and surrounding environment.” Right here in my home town and with a sizable discount for educators, an eight week Mindfulness Based Stress Reduction class was being taught. “MBSR brings together mindfulness meditation and yoga.” Mindfulness helps us restore and maintain a sense of well-being and develop the skills to avoid emotional and physical depletion. For more on the history of MBSR click here. I figured it couldn’t hurt, and at the very least it would make sure I got out of the house and off the couch. I hoped that it would even ignite my cerebral activities, like my short story writing and study of ancient history. Before I committed and enrolled I researched “mindfulness and stress reduction.” Congressman Tim Ryan, author of A Mindful Nation, is a wealth of information on the subject. He is leading a campaign to bring mindfulness into schools, the workplace, and even the White House! He routinely speaks about the many benefits of mindfulness and its potential to positively transform education, healthcare, and the work place. My personal and professional needs had been spoken to. I decided to act. I paid the fee and enrolled! Eight weeks later, I can testify to the power of disciplined, non-striving meditation. Even if mindfulness can happen only briefly during the day, perhaps in the form of a two-minute focus on breathing, it seems to make everything else that happens go more smoothly. This summer I have been able to accomplish a lot with one arm. My deck is painted and the garden now hosts a raised bed. My interactions with other people feel more sincere, probably because my mind is focused on what they are saying and not on what I’m going to do next summer. I see positive results from MBSR, but it did all happen, technically, when I was on vacation, and definitely not in the presence of thirty energetic twelve-year olds. 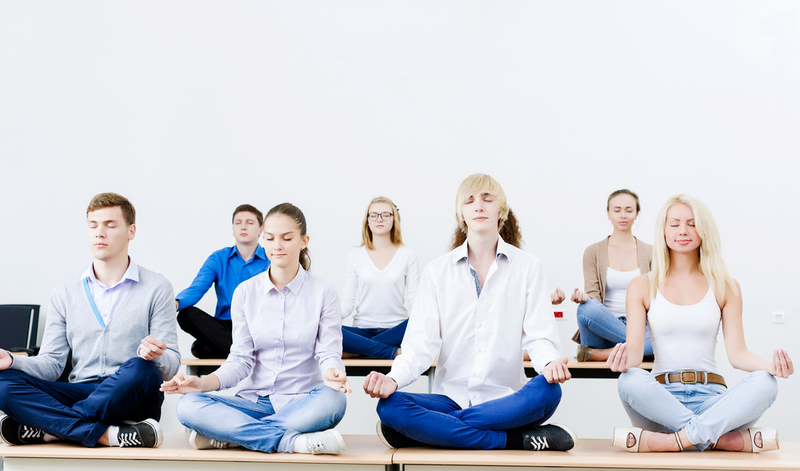 This year of teaching will be the true test of the stress reducing activities called mindfulness. Thank you for reading and sharing! Sign up for our mailing and keep in touch.